1In a large pot of salted water, cook the pasta according to the package directions, or until al dente. 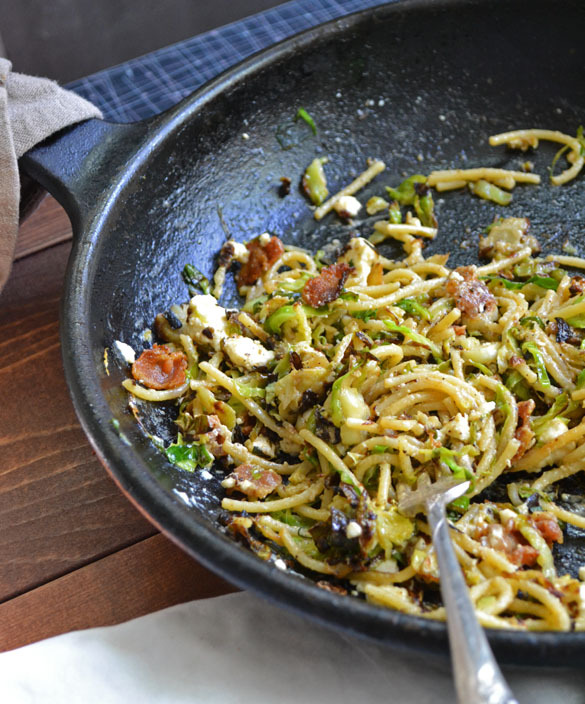 2While the pasta is cooking, cook the bacon in a heavy skillet set over medium-high heat; once the pieces are crisp, remove them with a slotted spoon and set aside, leaving the drippings in the pan. 3Add the butter to the skillet, and then the Brussels sprouts. Cook them for 5-7 minutes, tossing as needed and seasoning with salt and pepper, until they are soft and starting to turn golden on the edges. 4Reserve 1/4 cup of your pasta cooking water when you drain the pasta, then and add it to the skillet along with the cream. Add some of the reserved pasta water if it seems dry, and toss to combine. Taste and adjust seasoning (this dish loves pepper) and top with feta or goat cheese, tossing once or twice to combine.